I have recently been observing a lots of discussions around connectivity in the stadiums. I have used this picture above a few times to show different solutions available in different situations. You can see that in theory Wi-Fi, DAS, Micro and Pico would all be suitable for the connectivity in stadiums. In practice this is generally limited to DAS and Wi-Fi. For the main stadium bowl, The Cloud designed for 50% concurrent access for the maximum 30,000 crowd, connecting 80 Wi-Fi access points using 1km of fibre and 9km of CAT6 ethernet cable. Each access point can handle up to 250 concurrent users. Tightly focussed beams were used to segregate seating blocks, splitting these into distinct coverage sectors. To simplify the design, the older 802.11b standard wasn't used/supported, VoIP was blocked and a maximum of 3 SSIDs assigned. Unlike a cellular system, there's no handoff as you move around the stadium – you'd need to reconnect and create another session. During peak usage, almost everyone is sitting down rather than moving about (if you ignore those jumping up and down on their seats). Both Wi-Fi spectrum bands at 2.4GHz and 5GHz were used, with devices capable of the higher frequency prioritised to use it. 56% of clients used the 5GHz band, which has much more spectrum and many more channels available. The different propagation characteristics mean there are different coverage footprints, so planners are actually designing two networks rather than one. The side lobes on the 5GHz coverage footprint were massive, limiting the number of Wi-Fi access points that could be deployed. 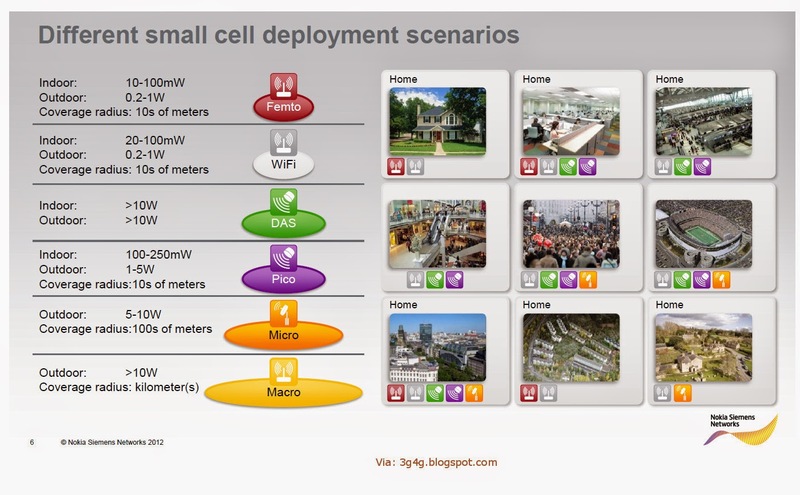 You can read the complete article on the ThinkSmallCell website here. A question some people often ask is why bother with connectivity in the stadiums. There are many reasons and personally, I would rather have connectivity than don't, even if I am not going to use it. 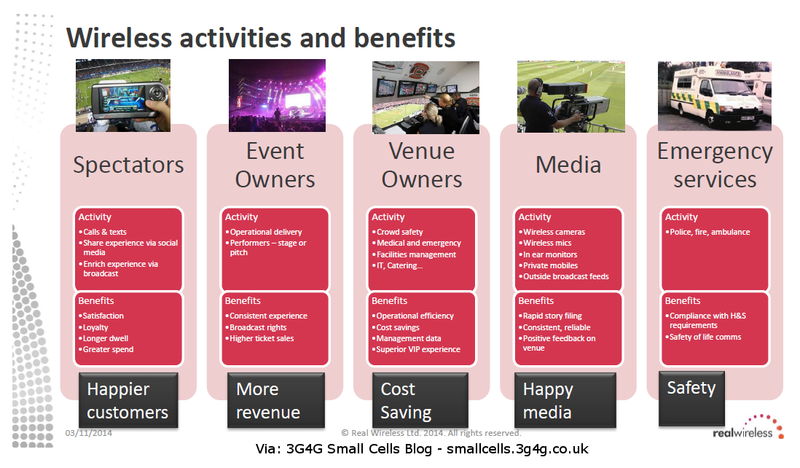 Real Wireless has done substantial amount of work in this area and a slide from their recent presentation discusses the benefits for various parties very well. You can read their opinion on this topic on their website here. So far this season, there have been 119 pro football games and 214 college football games played across more than 75 different venues where we provide in-venue coverage via Distributed Antenna Systems (DAS). In total, across these 333 games our customers have used more than 104.9 Terabytes of mobile data on our in-venue cellular networks. That’s the same as 104,913 Gigabytes. Or more simply put, it is equivalent to more than 300M social media posts with photos. At this point in the year, pro football fans are edging college fans in average data usage per game by a 342GB to 293GB margin. Or a difference equivalent to about 140K more social media posts with photos per game on average. Fans used more than 477GB of data on the AT&T cellular network during the game on 10/25. This is equivalent to more than 1.36M social media post with photos. This marked the highest single game total for cellular data usage at AT&T Park in ballpark history. Fans used an average of approximately 447GB of data per game over the weekend on the AT&T cellular network. This is equivalent to more than 1.27M social media post with photos. It’s an increase of approximately 29% in cellular data usage compared to the average game during the League Championship series vs. St. Louis. It’s an increase of approximately 109% in cellular data usage compared to the average game during the final home series of the regular season vs. San Diego (9/25-9/28). The peak hour of data usage during three home games was on 10/25 was from 5-6pm PT, the hour in which the first pitch occurred. In this hour more than 83GB of data crossed our venue-specific cellular network. On our AT&T Wi-Fi network we saw more than 1,626GB of data move across our network during the game on 10/25. This is the highest single game Wi-Fi total in the history of AT&T Park. 1,626GB is equivalent to more than 4.65M social media post with photos. This showed an increase in Wi-Fi usage of approximately 302% compared to the average game during the 2012 World Series. This showed an increase in Wi-Fi usage of approximately 163% compared to the average 2014 regular season game at AT&T Park. This showed an increase in Wi-Fi usage of approximately 29% compared to the average game of the League Championship series vs. St. Louis. The collective data usage equaled approximately 2.1TB of data across both our cellular and Wi-Fi networks at AT&T Park during the game on 10/25. This marked the highest single game total for collective data usage (cellular and Wi-Fi) in AT&T Park history. 2.1TB is equivalent to more than 6M social media post with photos. Note: All cellular data is specific to only AT&T customers using the DAS network at AT&T Park. AT&T DAS guru Paula Doublin was one of the most memorable speakers at this year’s HetNet Expo. The company’s AVP for antenna solutions, DAS and small cells did not shy away from questions about AT&T’s budget for heterogeneous networks, nor did she sugar coat the outlook for small cell deployments. A video of her presentation is embedded below and a writeup is available on RCR Wireless website here. Real Wireless does a huge amount of work on connectivity in stadiums, for some of the biggest venues.